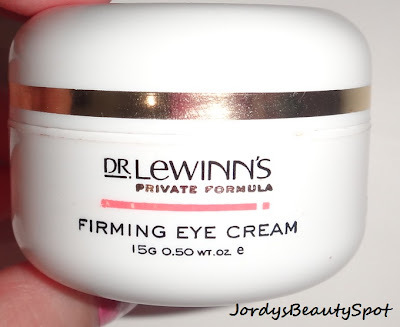 I have a quite exciting review on the Firming Eye Cream from Dr. Lewinns and I have been wanting to review this product for a while now but I really wanted to properly test it out so that I could give it a really good in depth review. Choosing the right eye cream is really important but sometimes it requires you to try out a couple of products before you find one that works well for you. 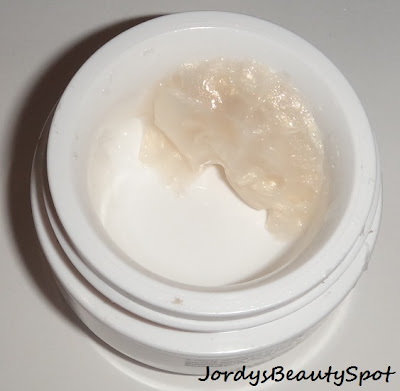 I hope my review helps you decide if this eye cream is worth trying out and assists you in finding your perfect eye cream. Promises To: help re-hydrate and moisturise the delicate eye area. Dr Lewinn's Firming Eye Cream assists in smoothing out the appearance of fine lines and helps to reduce the appearance of puffy eyes. The aloe vera gel has a soothing effect on tired eyes. Keep in mind: Results may vary person to person due to factors such as age, skin type, severity of under eye damage and expose to the elements therefore my review is based upon my personal experience and reviews may contradict each other. Also, I know that I am young and wrinkles have not yet appeared but I use it as a preventative thing, not because I think I have wrinkles or anything like that. Formulation: It is a sticky thick gel consistency which is great because it's a long lasting product but it makes it a little difficult to apply. Price: $54.95 for 30g is expensive but this eye cream is to be used sparingly so it really will last you a pretty long time. Effectiveness: This is a firming eye cream so the main thing I was looking for was my under eyes to tighten up a little bit which I think I have slightly noticed happen, surprisingly enough I think it actually does do what it says! Something else which I noticed was that it reduced redness and puffiness if you use it in the morning, even better than the Clinique All About Eyes Serum does! Quantity:You can probably tell by the picture that you don't actually get much product in there! Of course I have used some but even when brand new, the little tub was not full at all which is kind of disappointing because it is so expensive for such a small amount of product. Scent: The scent is actually quite pleasant, it smells a little floral but mainly just like a cosmetic cream which is good because I always get put off using products where I have to plug my nose to be able to apply it, especially around the face. Packaging: The products comes packaged in just your basic little tub with an unscrew lid and a little divider underneath the lid. Usage: It contains the ingredient mica, as a light deflector if daytime use is desired but you can use this at night time also. It doesn't matter so much what time of the day you use it, just be sure to use it once everyday. I do prefer day time use though because I feel a burning sensation under my eyes when I put it on after my toner and moisturizer at night. Perhaps reacting with the other products? So overall, I was really impressed with this product because rarely do I find results similar to those promised on the bottle! If you looking for a new eye cream I would recommend this one just because my experience with it has been awesome! Keep in mind, it is an investment as it is so expensive but it will last you quite a while as you need such a small amount. It's great for not only reducing the viability of wrinkles but also preventing them! I would look into this product also if you are a lover of the Clinique All About Eyes serum because it has the same results in regards to de-puffing and reducing redness in the morning as well as the added anti-aging benefits. Eye cream reviews stated that the first thing you should do before using an eye treatment is to inspect your face closely and check for your primary problem.